BEIJING — China's first aircraft carrier has set off for the Western Pacific for an open-sea training exercise, the Defense Ministry said. 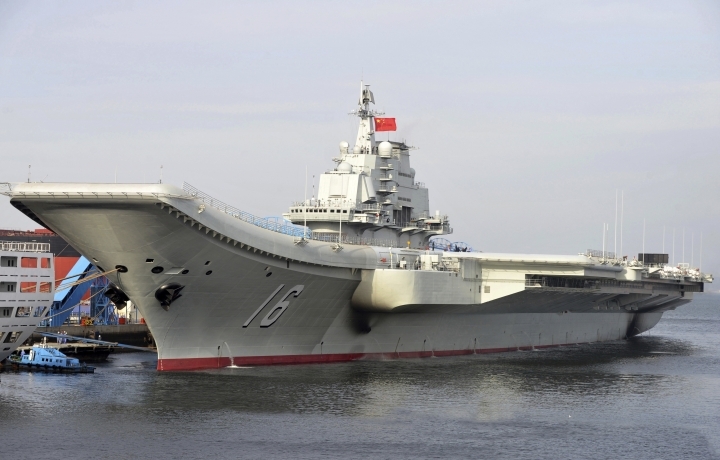 State media said Sunday that it is the first time that the Liaoning, which was commissioned by the Chinese navy in 2012, has headed to "distant sea waters." The Western Pacific region stretches from China to New Zealand and encompasses countries in the Pacific, Oceania and parts of Asia. The exercise takes place at a time of tension between China and the United States, the Pacific Ocean's dominant power, over the sensitive issue of Taiwan, a self-governing island that Beijing claims as its territory. President-elect Donald Trump took a congratulatory Dec. 2 phone call with Taiwanese President Tsai Ing-wen, marking the first time an American president or president-elect has publicly spoken to Taiwan's leader since Washington broke of its formal diplomatic relationship with Taiwan in 1979. To outrage in Beijing, Trump later suggested he could reevaluate U.S. policy on Taiwan. China seized a U.S. Navy underwater glider in the South China Sea on Dec. 16 in what was seen by Chinese analysts as a warning to Trump. China said last month that its aircraft carrier, purchased as an incomplete hull from Ukraine more than a decade ago, was ready to engage in combat. The Liaoning recently completed its first live-fire exercise along with fighters in the Bohai Sea in eastern China and, on Friday, the military announced it had carried out a series of fighter launch, recovery and air combat exercises slightly farther afield in the Yellow Sea. On Saturday morning, the Liaoning carried out training in the East China Sea, according to footage shown on state broadcaster China Central Television. A separate statement from the Defense Ministry said that several carrier-based fighter jets and helicopters took off one after another and returned after completing an air tactical confrontation and air refueling exercise. The Japanese Defense Ministry said it spotted the Liaoning as part of a fleet of eight Chinese warships that included destroyers and frigates, in the central part of the East China Sea for the first time. It said there was no incursion into Japanese waters.